Widodo is leading presidential challenger Prabowo Subianto, a former general, by double-digits in most opinion polls going into Wednesday's poll. Earlier, the capital's already congested streets were jammed with colourful parades and peaceful demonstrations, bringing traffic to a standstill. At the main stadium, Widodo supporters waved Indonesia's red-and-white flag as they sang and danced to performances by dozens of musicians. "Our country is a big nation of different ethnicities, religions, traditions and cultures," he said. "God willing, with Prabowo and Sandi we will create a fair and prosperous Indonesia," Uno told the crowd. 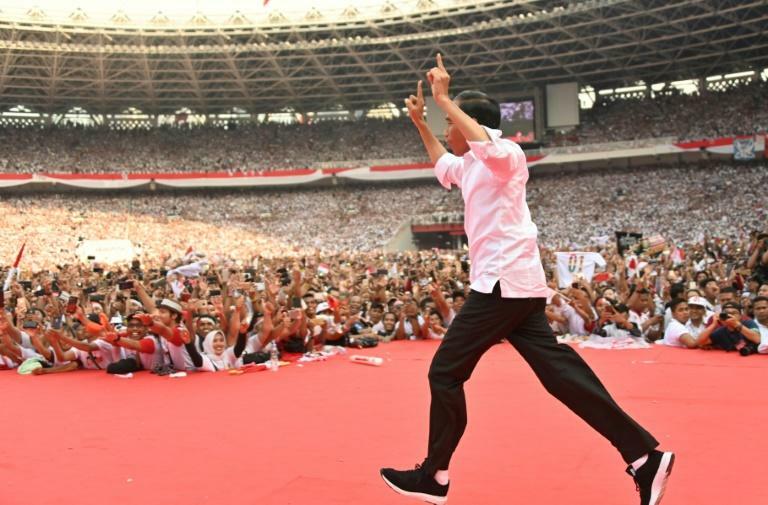 Subianto's team has warned it would challenge the results over voter-list irregularities if he lost -- setting up a repeat of the pair's 2014 contest, which Widodo won despite an unsuccessful court challenge to his narrow victory. Widodo campaigned on his infrastructure-driven bid to rev up Southeast Asia's largest economy, while Subianto pledged more defence spending and a review of foreign investment in the sprawling archipelago. "I want change that will make this country better," said the Subianto supporter, who goes by one name.